The Combine is over and the 2015 NHL Entry Draft is drawing near as the Winnipeg Jets’ management not only studies lists of potential prospects but also takes an inventory of players who are already in the system. The depth chart at every position is being carefully examined with expectations and predictions noted for each player in the system. When it comes to goaltending, both Ondrej Pavelec and Michael Hutchinson both took turns wowing Jets’ fans this past season, while Connor Hellebuyck had a coming-out party of his own at the 2015 World Championships. Then there is young Eric Comrie, who posted a .920 SV% in 3 games with St. John’s last year and is still eligible to return to the WHL next year. Many hockey minds would be satisfied with those four names heading into the draft and next season, but with that being said, there is one young man from southern Ontario who is determined to make sure his name is mentioned with the likes of those four goalies. Jamie Phillips was drafted in the 7th round, 190th overall by the Winnipeg Jets in 2012. The 6’4, 195 pound goaltender played junior hockey with the Pembroke Lumber Kings, Powell River Kings and Toronto Jr. Canadiens before accepting a scholarship to Michigan Tech. In 2011, Phillips would backstop Pembroke to an RBC Cup Championship. However, during his first two seasons with Michigan, the Caledonia, Ontario native would only appear in 22 games collectively, being relegated to back up duties with the Huskies. For the past two seasons Phillips had to watch as the likes of Comrie, Hellebuyck and Jason Kasdorf appeared in starting roles with their respective clubs and enjoyed success. “It hasn’t been easy but I can’t say enough about the Jets and how professional they have been with me”, explains Phillips, “Jimmy Roy (Director of Player Development) went to Michigan Tech and even though I wasn’t playing lots, he has always given me positive feedback the entire time I’ve been here”. Phillips is quick to sing the praises of the Jets and the Huskies but knew that the clock was beginning to tick in terms of his development with half of his NCAA career already completed. The goalie who backstopped the historical Pembroke Lumber Kings to their first RBC Cup, left his sophomore year at Michigan Tech determined to come back and make 2014-15, his year. 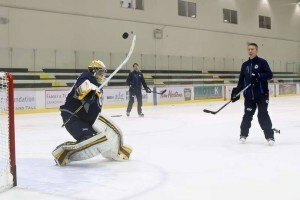 The Huskies were ready to do whatever they could to help Phillips and on July 14th, 2014 they did just that, by hiring goaltending legend Joe Shawhan as an assistant coach. Shawhan had coached Vancouver Canucks’ starter, Ryan Miller in junior and had been a staple in Michigan hockey since the mid 90’s. “I was brought in to work with Jay and make sure he was ready to assume the starting role”, says Shawhan, “He has been an absolute pleasure to work with and we really worked on consistency along with being able to make that desperation save”. Under Shawhan’s eye, Phillips suited up for 41 games, going 28-9-2 while posting a 1.74 GAA and .933 SV%. He would also be a finalist for the Mike Richter Award, given to the NCAA’s top goalie and the same award which Connor Hellebuyck won in 2014. When it comes to Phillips’ future with the Jets, Shawhan is convinced that the exercise science undergraduate, has what it takes to be a full-time starter in the NHL. “Jamie has more athleticism than most people give him credit for”, explains Shawhan, “If you compare Hellebuyck’s numbers to Jay’s, they are pretty close and he is going to continue to develop”. In one year, Phillips has gone from a questionable prospect to a bona fide starter in the NCAA, seeing almost double the amount of games than the previous two seasons combined. “I brought a level of consistency this year and I was concentrated on stopping as many pucks as possible”, Phillips states, “I want my play to speak for itself”. Phillips name was called on draft day in 2012 but he isn’t satisfied with that being the climax of his career. He is confident heading into next season that his name will be solidified on the depth chart and will be ready to battle for a starting role in years to come.